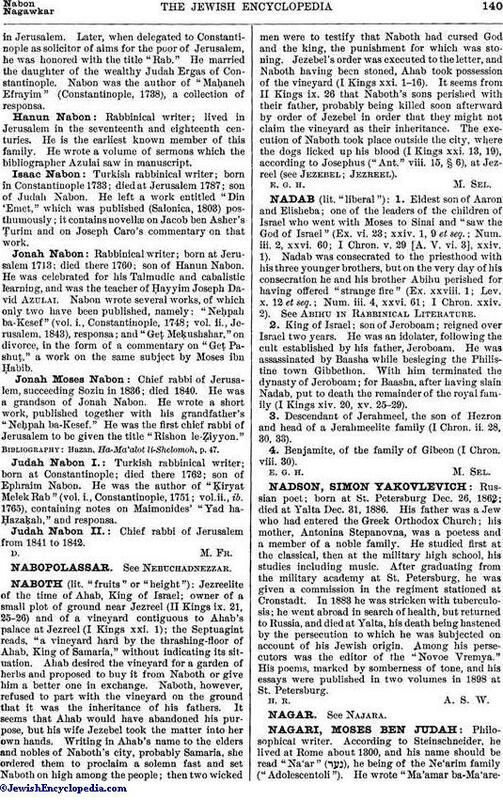 Jezreelite of the time of Ahab, King of Israel; owner of a small plot of ground near Jezreel (II Kings ix. 21, 25-26) and of a vineyard contiguous to Ahab's palace at Jezreel (I Kings xxi. 1); the Septuagint reads, "a vineyard hard by the thrashing-floor of Ahab, King of Samaria," without indicating its situation. Ahab desired the vineyard for a garden of herbs and proposed to buy it from Naboth or give him a better one in exchange. Naboth, however, refused to part with the vineyard on the ground that it was the inheritance of his fathers. It seems that Ahab would have abandoned his purpose, but his wife Jezebel took the matter into her own hands. Writing in Ahab's name to the elders and nobles of Naboth's city, probably Samaria, she ordered them to proclaim a solemn fast and set Naboth on high among the people; then two wicked men were to testify that Naboth had cursed God and the king, the punishment for which was stoning. Jezebel's order was executed to the letter, and Naboth having been stoned, Ahab took possession of the vineyard (I Kings xxi. 1-16). It seems from II Kings ix. 26 that Naboth's sons perished with their father, probably being killed soon afterward by order of Jezebel in order that they might not claim the vineyard as their inheritance. The execution of Naboth took place outside the city, where the dogs licked up his blood (I Kings xxi. 13, 19), according to Josephus ("Ant." viii. 15, § 6), at Jezreel (See Jezebel; Jezreel).